Intel is currently working on its new project which is set to release next year. 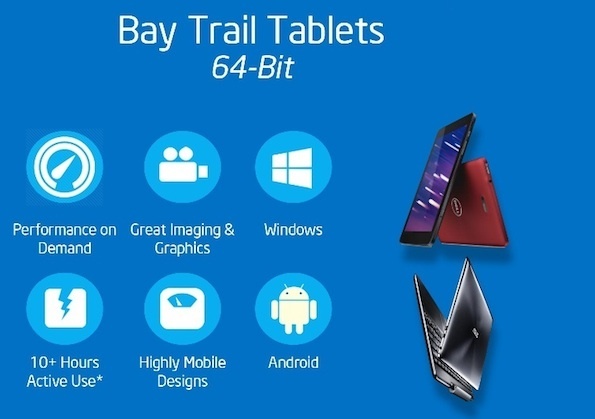 Intel is coming up with tablets that will be running a 64-bit version Android OS on an Intel Atom chip called as the “Bay Trail”. Krzanich the CEO of Intel said that right now they are working on the development of the 64-bit version of Android OS that will work with the Bay rail chips. Intel will be coming up with both Android OS and Windows 8.1 OS both running on the same 64-bit Bay Trails chips. He also said that the Bay Trail Android tablets will be sold for around $150. As of now tablets that are running on Intel and ARM processors are all 32-bit and it will be a huge improvement both in performance and graphics when it will be shifted to 64-bit and it’s not sure about what working Android OS will be running on Intel’s 64-bit Bay Trail chips. Intel is currently trying to promote Android’s new OS version 4.4 also called as Kitkat. Intel will surely give a run to the Apple’s new tablets, the iPad Mini and the iPad Air which are already in the market running with Apple’s new A7 chip running 64-bit, which is said to be faster compared to their old tablets in application and graphics performance. A 64-bit version can take up more memory as compared to the old 32-bit and this means that tablets and future smartphones will have more RAM. Up till now we have only seen upto 3 GB of RAM in a high end smartphone that is Samsung’s new smartphone the Note 3. It also allows better performance in graphics and video streaming as well as video calling if it comes to smart phones. Almost all the tablets are equipped with ARM processors and now with Google and Intel working with each other they will surely come up with tablets that will work better than the tablets running with the ARM processors. The main aim of Intel right now is to provide chips that will allow OS flexibility on their tablets which will help in coming up with cheap tablets that everyone can afford.